So well deserved by everybody involved! Colour of all spouting and joinery? We are about to reclad and put in new spouting and joinery in our 70’s pole house in Titirangi with irregular random width vertical cedar shiplap and I think your colour choice will be just perfect for our coastal bush setting. All of our spouting and joinery is Ironsand. It looks great as a scheme set against the native bush, so I’m sure it will transfer beautifully to your home with the similar setting! Hi. I love the way you have documented the ups and downs of building your house and you have ended up with a gem. I hope you don’t mind me asking, but I am thinking of using the SIP panels to build my little house an I wondered if you could pass on any advice? Are you happy with everything about them? Thank you. Looking forward to the next post. Thanks Penny! Yes, we are very happy with how the SIPs are performing and would certainly build with them again. I truly believe SIPs are the future of building in New Zealand because they make so much sense and highly recommend building with them. We started looking into prefabrication and Formance SIPs to speed the build up, save on construction costs and to be light on our site. Which they absolutely were and are a significant pro for building with SIPs. But in the end we’ve found the real benefits lie in the superior thermal insulation and air-tight envelope a Formance SIPs home provides, creating an extremely dry and healthy home to live in. The house is always warm and takes very little to heat even in the middle of winter, despite the huge amounts of glass that we have. Usually the sun is more than enough to keep us nice and warm, meaning our power bills are pleasant on the bank balance. Absolutely LOVE your website/blog shame I have only just stumbled across you guys as me and my hubby are just starting the build process over here in the UK and had the same idea of documenting our journey (although only a couple of posts in & very new to all this techy stuff)! Funnily enough our Builder is from NZ and has been recommending we use SIPS panels to build, but if im honest we have both been a bit nervous too with it being such new concept over here! currently reading up on your SIPS posts… finding really helpful! I know you must be super busy but would love to pick your brains and get some pointers and advice on a few things. Hey Lucy – thanks for getting in touch all the way from the UK! Awesome, an exciting few months ahead for you guys then! Absolutely, feel free to ask anything and hopefully can share our experiences with you. SIPs actually have been used for over 30 years through Europe and the USA, so they aren’t new by any stretch of the imagination up your way, but they are really new down here in the form that we used. So you should have no worries about long term performance in your environment and what we have witnessed during construction and lived in over the past 2 years, we have no concerns at all and if we were to build again today we’d use SIPs for sure. But fire through any questions as happy to help! Just noticed your website, wow, what an awesome section you guys have…looking forward to following the progress! We live in a Reserve in St Heliers, lots of beautiful bush to overlook, we love it! We are working out if we renovate or rebuild as we have a large old house with lots of funny roof angles and no flow! I’m very interested in the Formance panels as an option if we build, but am concerned cost wise they may work out more expensive than standard building. Do you think they work out evenly cost wise or more exp? I love the increased thermal insulation they offer and am seriously considering this as an option. Love your house, you both have done a fabulous job! Hey Sarah, sounds like you have a pretty awesome spot, love it over in St Helliers! You can’t compare the cost of SIPs directly to timber framing and insulation, as if you did that, SIPs are more expensive. However over the cost of the whole build, at a minimum SIPs are on par or maybe 5% more expensive. But if you have an easy to access site, you could feasibly have the walls up in a day, then a ceiling up the following 2-3 days. (in fact you can use fully finished roof panels that have the long run corrugate finish already fixed – check out Metal Craft Roofing and the Thermospan product). If you then had scheduled your joinery well and they were willing to manufacture off the plans, technically you could have a watertight structure in a week or so. That’s when you get some massive time and therefore cost savings. Living in the house you really appreciate the thermal benefits of them, and we’d definitely build with them again. I hope that helps? Feel free to fire through any other questions you have! Thanks Ben, its such a hard decision at the early stages of planning. Will look into it further and see how we go. Get our architect plans back this week so will get into it! Hi Ben and Kylie, congrats on a fantastic house! I watched the first 5 episodes ages ago, then somehow missed the rest. I’ve watched the rest over the past couple of days from a kiwi bank Facebook link, and I’ve been really impressed. I actually wanted them to be full 30-60 min episodes! I wanted to find some photos of your house (since I only saw the videos) and Google found this website. 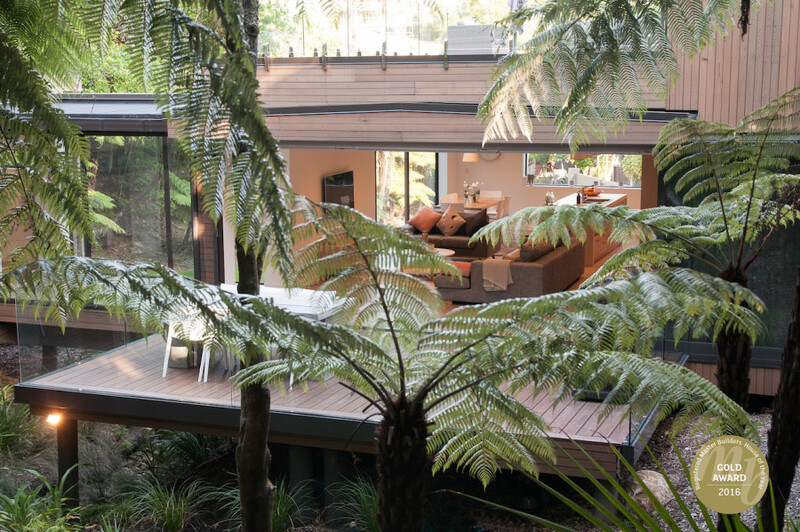 I love the native bush all around you and the stream is next level, speaking of levels, that roof top deck is a fantastic idea, and those stairs, wow. Do you have a spa yet? Would the roof deck be able to take the weight, it would be awesome up there. Anyhoo, congratulations and all the best.